I may have begun another bee book review this way, but the sentiment remains true. I love bees, and I love books about bees. 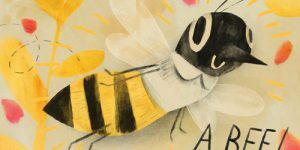 The Honeybee by Kirsten Hall and Canadian illustrator Isabelle Arsenault would make me fall in love with bees even if – gasp – I hated bees. Instead, this joyous, beautiful book makes me fall in love all over again. I didn’t start out that way. Like most, I feared bees, especially their array of stinger accessories, but the more trails I walked, the more flowers and gardens and fields I observed, the more my admiration grew for these tiny, gentle pollinators. The Honeybee takes us on a journey through the life of a bee, and a bee colony, as pollen is collected and honey created. The story trajectory is familiar – we all kinda know what bees do – but in word and image, The Honeybee stands alone as a thing of absolute beauty. Kirsten Hall’s playful poetry tells the story simply and humourously, but with a kind of meandering lilt, as if the words are perched on the hum of a bee. 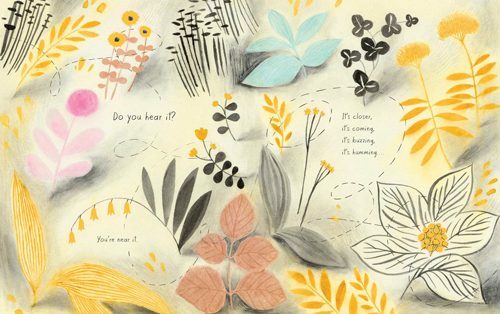 Isabelle Arsenault continues her run of stunning picture books, finding new ways to visually charm, and at the same time, comfort, with a throw-back warmth reminiscent of classic children’s picture book fare. 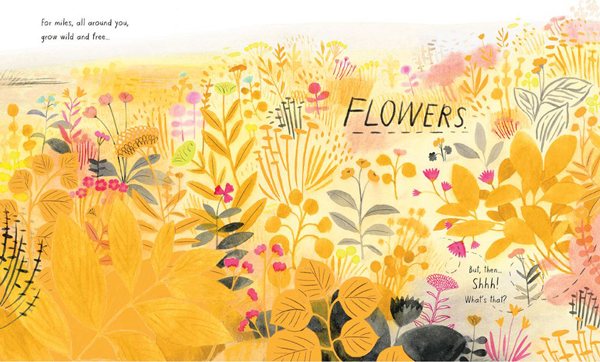 As the story begins, the reader is invited over a hill to a field of wild flowers, where a bee makes her debut in a celebratory, double-page spread. Yes, a bee, with an affable, smiling face and a pair of big friendly eyes. Perhaps not quite an accurate portrayal of Apis mellifera, but true to the jubilant spirit of the book. This bee is an absolute darling, buzzing and humming through the pages as she whirls around fields of wild flowers collecting pollen. Who better than Isabelle Arsenault to imagine this blossomed landscape? 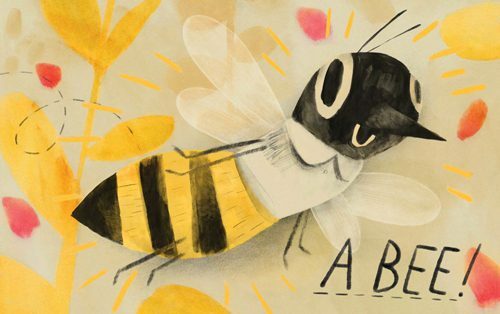 The three-time Governor General Award-winning illustrator makes yellow and black, and its variations, the dominant colours – a nod to the bees’ striped apparel. The pops of pink and blue in the flowers are all the more stunning against this honeyed backdrop. Like a hive, every element – from Hall’s storytelling to Arsenault’s glorious illustrations, work in balanced harmony. The text, which has a lovely hand-drawn quality, uses a font designed by Arsenault, named Honeybee. This book lives and breathes…and buzzes…its subject matter. The Honeybee does what most children’s books with a message fail to do. It charms, eliciting an appreciation in the reader not only for bees and the work they do, but for the natural environment that supports their livelihoods, and tangentially, ours. Author Kirsten Hall has a deft hand, lovingly and reverentially telling the story of the honeybee. In making us fall in love, we are much more apt to respond with love. As she states in the postscript: “I wrote this story for an important reason. The honeybee is one of our world’s most marvelous creatures. And sadly, it’s in danger. In writing this book, I was hoping you might grow a new appreciation for the honeybee – and that you’ll join me in caring about its future.” Mission accomplished. 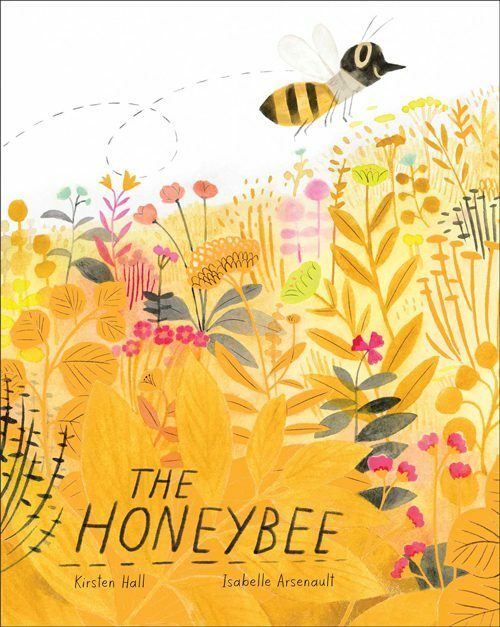 The Honeybee by Kirsten Hall, with illustrations by Isabelle Arsenault. Atheneum Books, 2018. 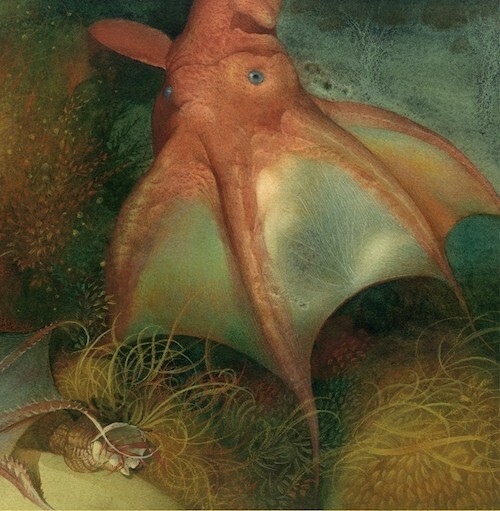 When Brenda Z. Guiberson met Gennady Spirin, the picture book gods and godettes smiled. 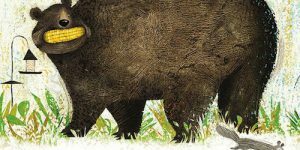 Since their original collaboration Life in the Boreal Forest, the talented twosome have been creating THE most beautiful, non-fiction picture books around. It’s not possible to pick a favourite, although I will admit to a strong affinity for the frogs in Frog Song, and as a resident of the north, how could I not love the moose in Life in the Boreal Forest? Nevertheless, their newest venture The Most Amazing Creature in the Sea is truly amazing, as the title suggests. It’s so strangely beautiful, in fact, it could be a collection of alien creatures as imagined by some unfathomably inspired and slightly demented dreamer. In the interest of full disclosure, I am not a fan of the sea. 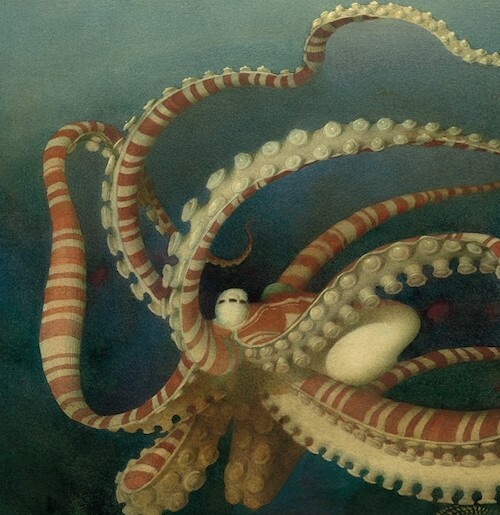 I respect it, I worry about it, and I’ve enjoyed dipping my toes in it, but aesthetically – I prefer a nice tree over a squid. 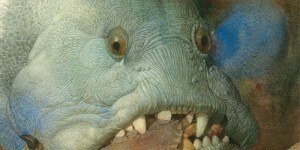 For reasons that I don’t quite understand, fish creep me out. The Most Amazing Creature in the Sea will not endear the squeamish, like me, but it will beguile. The creatures range from Box Jellyfish (and its millions of stinging toxic cells) to the truly bizarre Barreleye Fish, also known as the spook fish – for good reason: it’s got a transparent head. 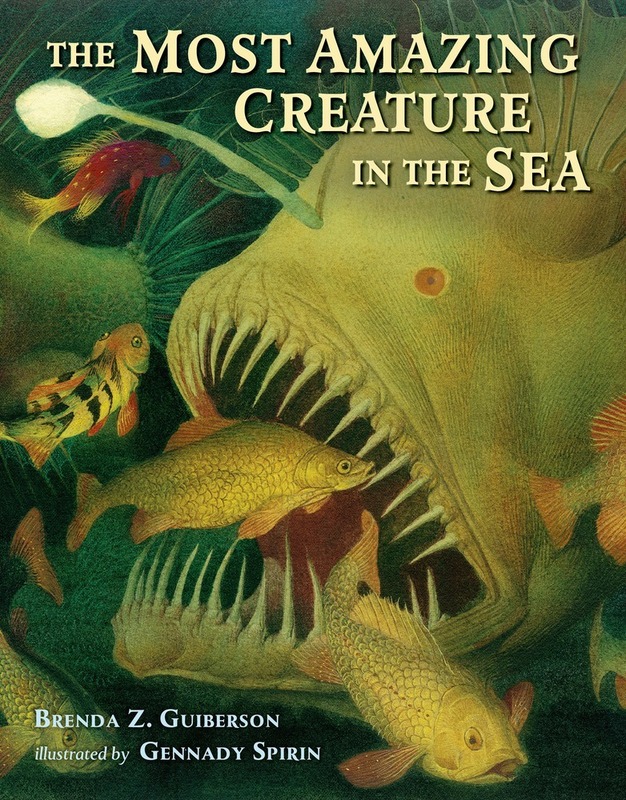 There are other non-orifice-clenching sea dwellers represented in the book, like sharks and leatherback sea turtles, but each in their own particular and often peculiar way, are vying for the title of the most amazing creature in the sea. Amazing, for sure. Also horrific, nightmarish and spectacularly homicidal. Guiberson and Spirin show us a fantastical world that stuns the intellect, astonishes the eye, and confronts our deepest fears. And don’t even get me started on Hagfish (aka ‘the snot fish’). The Most Amazing Creature in the Sea is a thing of wonder. I may not ever want to meet one of these creatures outside of a Stephen King novel, but I marvel at their very creation. In compelling, but simple detail, Guiberson conveys the individual quality of each creature while making a case for their growing endangerment. As with Life in the Boreal Forest and Frog Song, the author’s notes include additional information about the environmental pressures faced by these and other creatures of the sea, as well as links to conservation organizations. 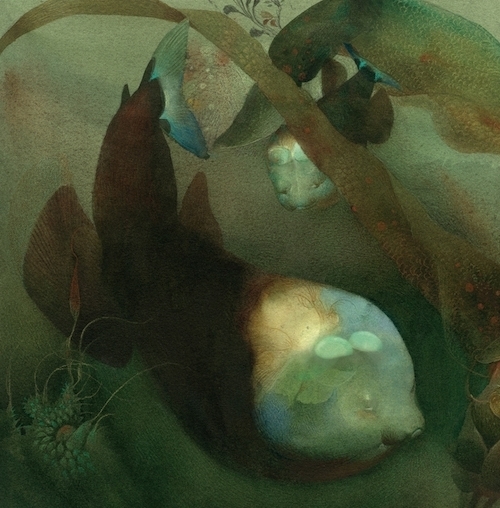 It is Gennady Spirin’s illustrations that elevate the book from an interesting and informative read to a work of art. 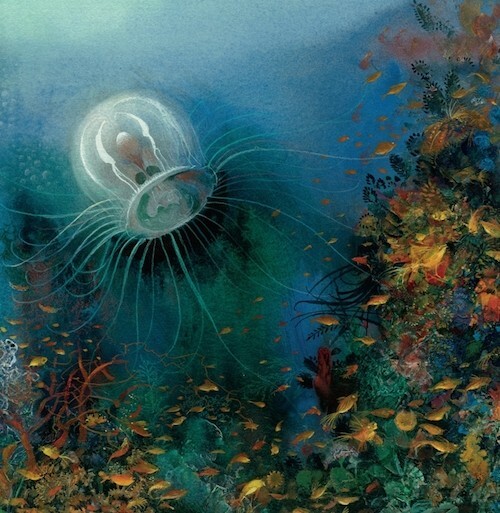 How beautifully he imagines this undersea world! It’s as if someone has opened a long buried treasure chest and all the gold and jewels have wafted out, setting the sea alight. I try very hard not to draw a distinction between fine art and illustration, but as I have said before in other posts about this Russian illustrator, Spirin’s paintings are true masterpieces. They would be at home in a museum. In countless publications, most of them re-tellings of traditional folk and fairy tales, Spirin pulls out exquisite detail in tempera, watercolour and pencil, creating illustrations that appear torn from a 500 year old illuminated bible. They are luminescent, flecked with gold, delicately and richly coloured. The virtuosity of the illustrations suggest (or perhaps demand) a leisurely pace, but Spirin is prolific, which is great news for those of us who are greedy for each new publication. 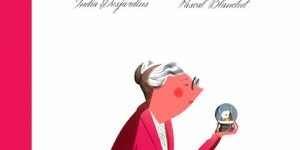 Interestingly, he does not discriminate – whether its Chekhov, Hans Christian Andersen or Brenda Guiberson – every illustration gig gets the full Spirin treatment. It’s not a stretch to think he (and Guiberson) reveled in the peculiar, almost supernatural details of these creatures, imbuing them with character in spite of their utter lack of charm. 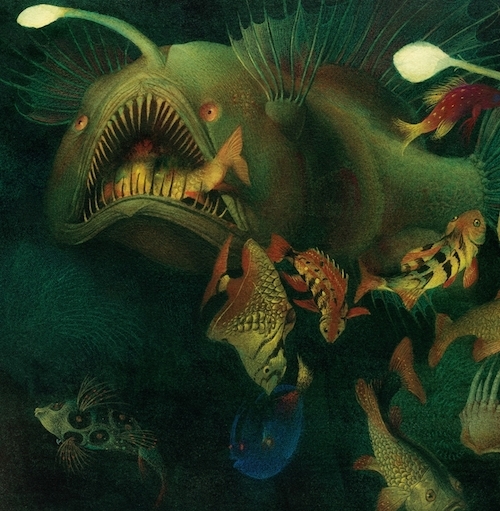 I’m sure they’re fine fellows in their own right, but as I have already mentioned, I’m not drawn to the ocean, but in the hands of a brilliant illustrator like Gennady Spirin, I find its creatures admirable, if only for the sheer weirdness of their existence. 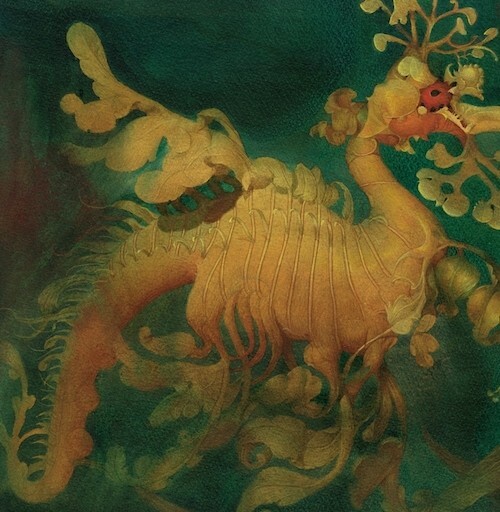 Gennady Spirin studied at the Moscow Art School and the Academy of Arts, as well as the Moscow Stroganov Institute, and currently lives in Princeton, New Jersey. Together with Guiberson, he has published three other books: The Greatest Dinosaur Ever, Frog Song and Life in the Boreal Forest. Beyond this, however, Spirin has created dozens of books, all of which are little masterpieces of illustration. 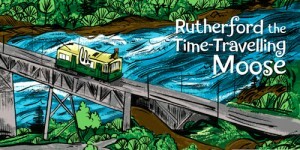 Brenda Z. Guiberson is an author and illustrator who has had a life-long interest in science. 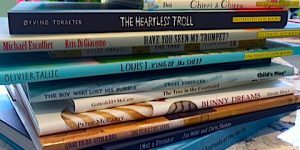 Hailing from Washington state, Guiberson has written many books for children, including Cactus Hotel, Spoonbill Swamp, Moon Bear and Disasters. I am very happy to report that a sort of sequel to this book will be published in 2016 called The Deadliest Creature in the World. Here’s a sneak preview. It started out simply. Ceri Levy, a film-maker, inspired by the subjects of his most recent documentary, The Bird Effect, embarked on an exhibition of extinct and endangered birds, soliciting work from a number of artists, writers and musicians, including one Ralph Steadman. Asked to produce a single extinct bird illustration of his choosing, Steadman, a life-long balker of rules, created more than 100 avian masterpieces; birds of every species, including the newly ‘discovered’ Lousy Grudgian, the Humpbacked Blue Mult, and the Gob Swallow. A special room was dedicated to his illustrations for the duration of the Ghosts of Gone Birds exhibit in 2011, and in 2012, in collaboration with Ceri Levy, Extinct Boids was hatched. In spite of the title and the giant heart on the cover, Hug Time is not a conventional Valentine’s Day book, unless your object of affection is a blue whale, or a baobab tree. However, considering my other VD recommendations (at the end of this post) involve fruit and frogs, Hug Time is entirely within the scope of the 32 Pages Valentine’s oeuvre. Hug Time is actually an environmental book, starring Patrick McDonnell’s favourite little environmentalist, animal advocate, and resident tiger lover, Jules, also known as Shtinky Puddin’ in the comic strip Mutts, from which this character originates. Jules decides that our ailing world is in need of hug, and sets out to remedy the situation. I can think of a few more things the world needs (more cowbell, for instance), but a hug is always a good place to start. Ever resourceful, Jules packs only what is necessary for such a journey, his favourite green sweater and a hug to-do list. If only my cat traveled so lightly.